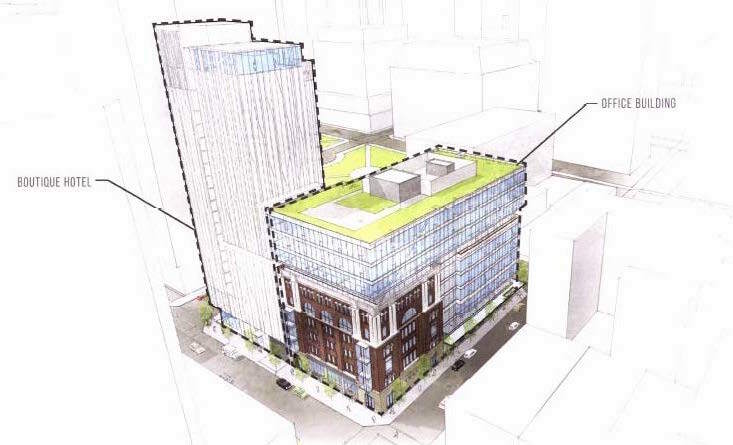 This entry was posted in 250 Taylor, 3rd & Salmon, Allied Works Architecture, Broadway Corridor, Conway Masterplan, Kaiser Block 80 Garage and Plaza, Lever Architecture, Multnomah County Health Department HQ, PNCA 511 Building, Portland Rock Gym, Society Hotel, The Porter Hotel, Treehouse, weekly roundup. Bookmark the permalink. This seems like a superb opportunity for adaptive reuse. A combination of taller buildings with adjacent historic buildings would make for a much more engaging and dynamic project, rather than demolishing the Card Room building and engulfing the Temple building. The city has some useful items in their toolbelt – what about a FAR (floor area transfer)? By transferring the allowed height from these two historic buildings, the new buildings could go taller. This technique was recently used for a new Pearl District building (http://www.nextportland.com/2015/11/04/the-diane-2/#more-5252), and this seems like an ideal use case for using it again. Imagine these historic buildings getting lovely rooftop decks, which could be accessible from the respective buildings as well as from the adjacent new buildings. There would be so many creative possibilities, and we have so few truly historic buildings to preserve.